The first game in this sequence was against Newcastle on 30 August 1919. It was also the first ever top flight game at Highbury. It resulted in a narrow 1-0 win for the Magpies. Incidentally, it was also against Newcastle at home that the club made their league debut in a second division encounter on 2 September 1893 which ended 2-2. It was also Newcastle who played Woolwich Arsenal in the Gunners first ever game in the highest echelon on 3 September 1904. This was played at St James Park and saw Arsenal lose 0-3. So the decision to choose this home game against Newcastle was a very apt and well taken one. The whole official match programme entitled the “Jubilee Souvenir Edition” was taken up with information about the previous 50 years of the club: great players and great moments. 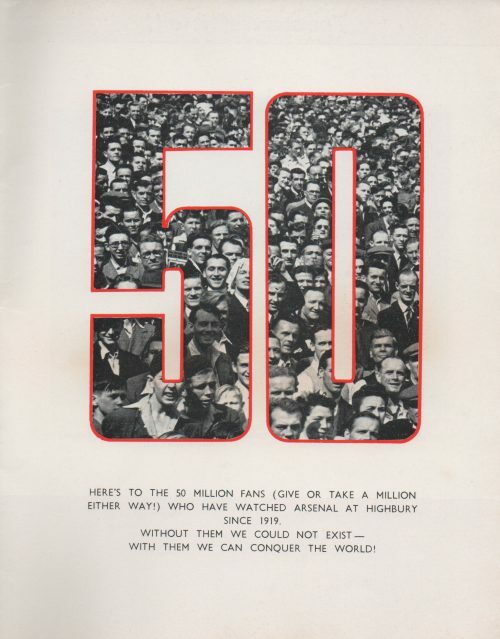 It contained details of FA Cup and League wins and highlighted such club greats as Herbert Chapman, Tom Whittaker, George Allison, Charlie Buchan, Cliff Bastin, Alex James, David Jack and a host of others. 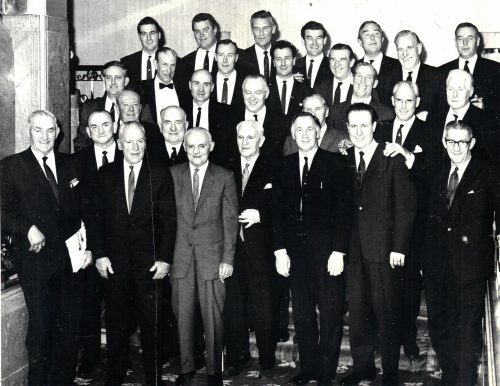 The current Newcastle players and officials were invited to the banquet along with as many former Arsenal players that could be found, together with the then current staff at the club. This photograph was taken during the proceedings and contained a large number of ex-Arsenal greats. See how many you can recognise, with out looking at the name tags below! Back Row: Cliff Holton, Leslie Compton, Alf Fields, Joe Wade, Dennis Compton, Bernard Joy, Reg Lewis. Four in front of them: Bill Seddon, Jack Kelsey, Len Wills, Ted Drake. Seven next row: Dave Bowen, George Hunt, Lionel Smith, Laurie Scott, Alf Kirchen, Ian McPherson, Archie Macauley. Three just behind front row on left hand side: Ernie Collett, Joe Hulme, Tom Parker. Front Row: Bill Harper, Bob John, Bryn Jones, Bert White, Joe Mercer, Don Roper, Ronnie Rooke. 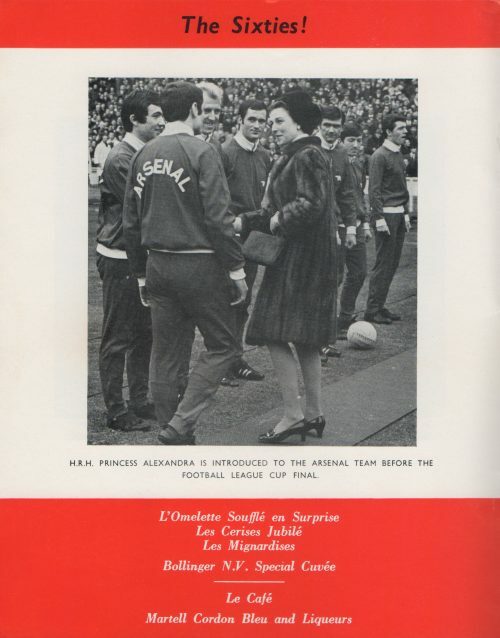 The banquet menu was presented as a 16 page brochure with the multiple courses set to correspond to each respective decade – the swinging sixties containing a great photograph of Frank McLintock in a classic tracksuit presenting the team to royalty at Wembley combined with an enigmatic surprise soufflé omelette! Whilst special mention was given to Herbert Chapman who was described as “the most chivalrous of rivals and the most loyal of friends” in a fitting epithet to the architect who made Arsenal the most famous club in the world during their dominance of the 1930s. The Bill Elliott Quartet provided the music and those present danced the night away until the heady time of 1:30am with popular choices selected and performed from all the different decades. The toast was to the Queen and the Arsenal football club – the ceremony was performed by Mr Shipman, the President of the Football League and both the Arsenal Chairman, Denis Hill-Wood, and the Chairman of Newcastle, Lord Westwood. At this particular juncture, Sunderland were the only other team that had managed a longer run in the top flight having spent 68 years there from 1890 to 1958. Their relegation left Arsenal in prime position to overtake them, which they did in 1987 although there were a couple of close shaves in the 1970s. It is also of interest to us all that, assuming we remain in the Premier League, the 100th consecutive year of Arsenal’s stay in the top flight is almost upon us. If both these teams are in the top flight during the 2018-19 season, the home game against Newcastle would be a fitting and historical way to celebrate this potential landmark. My first Arsenal match was also with my Dad on Saturday 21st October 1961,I was ten (10) years old. 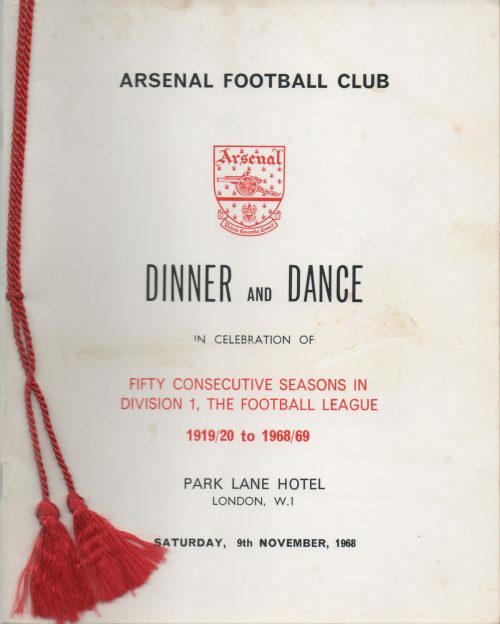 Arsenal won the match 5-1 the match programme cost sixpence I think my dad paid three(3) shillings not sure what it cost for me. Also went down to Sydney for the games there. I had a couple of years in Australia as a child. Lived in Hurstville. 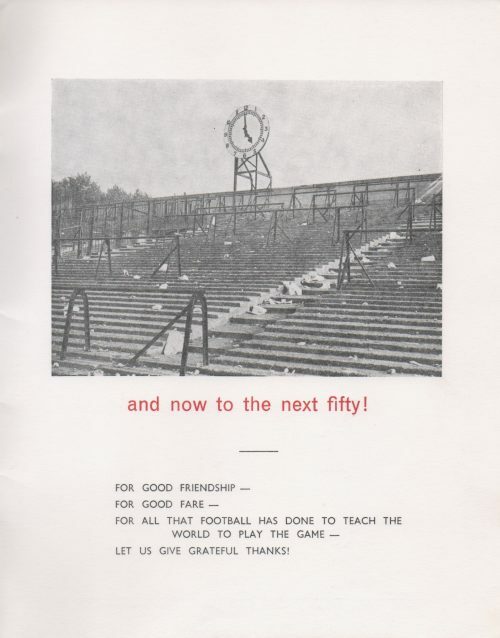 Came back here during early 1970-71 season and that was when I began supporting Arsenal. Still a young man of 76 years and working full time. I started watching Arsenal on the 27th December 1955, when my father took me to see them play Wolves at Highbury. Wilves were the most successful English team at the time and had a team of mostly English Internationals captained by Billy Wright. Wolves were leading and Derek Tapscott scored the equaliser close to full time. Great goalkeeping by Jack Kelsey kept us in the top division during this period and I hope that when the history of Arsenal is written for the 100th year celebrations that he gets due honour and respect as I still regard him as our best ever goalkeeper. So this season I will be taking my seat as I have done since we built the North Bank Stand and many of us bought Debentures. Good Investment. I am looking forward to a successful and positive season from fans (12th Man) and team. Thanks for the reminiscences. Quite agree about Kelsey, my dad rates him as our best keeper. He doesn’t get the credit he deserves as he was in a poor team for most of his career. Think as a cup team we may do quite well this season.